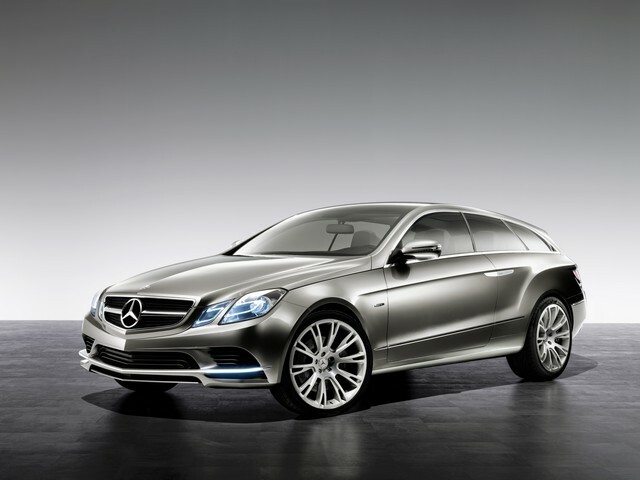 Mercedes-Benz builds the world's most desirable coupés - a claim which the Stuttgart-based car maker is underlining at the 2008 Paris Motor Show with its ConceptFASCINATION design study. This unique vehicle, whose innovative and unconventional proportions interpret the emotional appeal of a coupé in a new way, represents an exciting and intelligent combination of sporty and elegant design with stylish practicality. Wood, aluminium and smoked glass give a particularly exclusive look and feel to the luggage compartment which incorporates a refrigerated compartment and a humidor as well as offering a large load space. These attributes embody the two objectives of ConceptFASCINATION - to provide a high level of practical usability and to create a coupé which appeals to the heart with fast, thrilling lines. 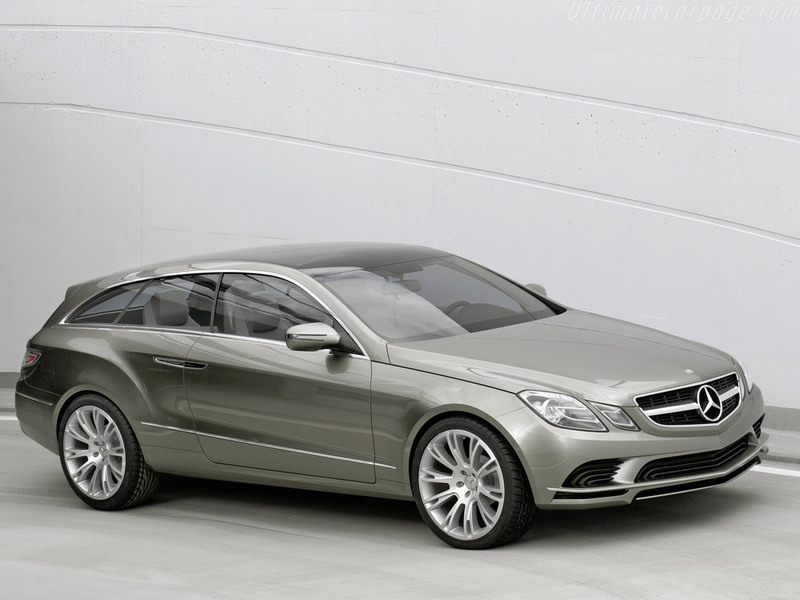 In developing this design study, Mercedes-Benz has given fresh impetus to the long-established (although now rarely seen) "shooting brake", a vehicle category with its own distinctive charisma. Freed from the constraints of a specifications book, the designers have created an automotive sculpture with great aesthetic appeal which once again demonstrates Mercedes-Benz's high level of design expertise. ConceptFASCINATION is a unique jewel of compelling automotive design which is distinguished by its irresistibly dynamic lines yet still offers the benefits of a large luggage compartment. A particularly notable feature of the design is that the practical load space develops organically from the exciting and elegant lines of this lifestyle coupé, giving it its special charisma. Inside, the tone is set by fine, exceptional materials hand-crafted to the highest standard. Absolute perfection and attention to detail make this design study an incomparable gem which conveys at one and the same time a sense of sporty forward movement and elegance, savoir-vivre and exclusivity of the highest level. The design study's elongated body is dominated by the dynamic front-to-rear sweep of its lines which gives it a dynamically charged look, evoking movement even when the vehicle is stationary. This impression is emphasised by the long, frameless, side-window line which describes a continuous arc from front to rear, uninterrupted by a B-pillar. As a result, the large load space in the rear is integrated in the vehicle body cohesively and harmoniously while also increasing the impression of length and creating a remarkable sense of lightness. The side windows can be lowered completely - one of the fundamental genetic markers of every Mercedes-Benz coupé - to provide an uninterrupted view of the stylish way in which fine materials have been used inside the vehicle. The distinctive front section of this gracefully built athlete is a picture of self-assurance. It remains loyal to the dual headlamp face, but interprets it in a more contemporary way. The now rhomboid headlamps, which are set against a grey background reveal the fascinating technical details of the light units which feature the latest LED technology as well as C-shaped fibre-optic inserts which serve as discreet running lights. With its new, sharper eyes and the surrounding lines and surfaces, the "face" of the ConceptFASCINATION vehicle is both exciting and forceful. The bonnet of the design study has pronounced contours with a central ridge which picks up the V-shape of the front end and continues it along the vehicle body. Powerfully framed, the single-louvre radiator grille with the central Mercedes star makes a very dominant and expressive statement of the brand identity. The forward-sloping rear also has a pronounced V-shape and features a spoiler, below which the third brake light is reflected in the rear window. Flat, horizontal LED lights which extend around the back, linking it visually with the sides, emphasise the width. In a styling move which is both clever and extremely harmonious, the undercut surround of the redesigned tail lights flows into the rear wings, serving as yet another example of the painstaking attention to detail by the Mercedes-Benz designers. 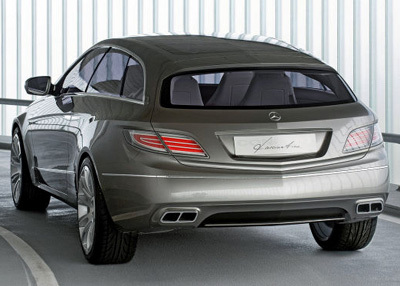 As at the front, the rear is completed by a small additional wing framed by four exhaust tailpipes. Contrast is provided by light, fine nubuck leather used for the other surfaces and the four individual seats as well as by the deep-pile carpet with heavy fibres. The seat centre panels are covered in strong, high-quality fabric. Trim strips in American walnut with a fine chrome surround complete the portfolio of materials. The characteristic V-shape of the exterior is picked up by the dashboard whose styling evokes a dynamic wing and which features an instrument cluster with five tubes and silver dials. Painstakingly crafted details give the load compartment a particularly luxurious and surprising character. The floor of the load compartment, which measures approximately one metre square, is made of wood with brushed aluminium protective rails. Folding up the floor at the left and right sides reveals two compartments containing two sets of binoculars as well as a high-quality digital camera with interchangeable Leica lenses - the perfect equipment for a day at the races, for example. The centre of the load compartment is occupied by a folding smoked glass table which rises out of the floor at the touch of a button to reveal a compartment housing a humidor. The table can also be pulled to the rear for easier access from outside. Doing so provides access to a refrigerated compartment for drinks and champagne flutes. The smoked glass can then be folded up at left and right to allow the vehicle occupants to enjoy a picnic in a stylish and refined ambience. Not content with just indulging the senses, the ConceptFASCINATION design study impresses with its technical underpinnings, too. These are drawn from the future E-Class Coupé and include the new four-cylinder diesel engine which features BlueTEC and AdBlue technology and develops 150 kW / 204 hp from a displacement of 2.2 litres.